Discovery suffered a setback during mating operations between the orbiter and her External Tank (ET-137) on Friday, when an internal nut – prepositioned inside the aft compartment of the orbiter – became loose and moved out of position, negating the possibility of installing a flight structural bolt. Engineers successfully accessed the area to conduct a repair, which was completed overnight. Discovery rolled over to the Vehicle Assembly Building (VAB) on Thursday morning, allowing for a sting to be attached on to the orbiter for the lift from the transfer aisle over to High Bay 3 (HB-3). As per routine, Discovery was first lifted off her Orbiter Transporter System (OTS) and rotated to the vertical position, allowing for photography to be taken of the Thermal Protection System (TPS) on her belly. Those photographs will provide a baseline for the Damage Assessment Team (DAT) when on orbit imagery is provided during her mission. “OV-103 / SRB BI-144 / RSRM 112 / ET-137 (VAB HB-3): First motion of the orbiter rollover occurred at 0654 yesterday morning. The Orbiter was spotted in the VAB at 1046. S0004 operations are continuing per the scheduled timeline,” noted the NASA Test Director (NTD) report (L2) on Friday morning. 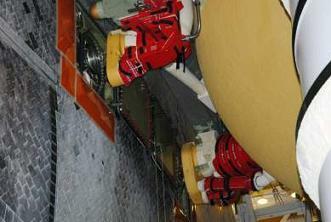 Mating operations between the orbiter and the External Tank usually takes a few days, with the first operation requiring the “soft mate” of the hardware. However, an issue was reported on Friday, relating to a problem between an internal nut and the installation of one of the two large flight structural bolts. 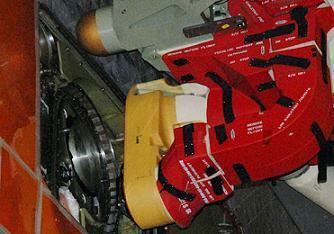 The nut in question is prepositioned inside the orbiter, with the bolts installed from the outside. When the bolt was being moved into place, the internal nut began turning and became loose – rotating 45 degrees off center. With the bolt unable to be installed until the nut could be repositioned or replaced, an Engineering Review Board (ERB) was called for. Engineers debated between setting up access to the aft compartment, or removing Discovery from the stack for a repair once she was horizontal, likely resulting in her returning to the Orbiter Processing Facility (OPF-3). Another consideration related to if they could install access platforms prior to the completion of mating – which is usually not allowed for safety reasons. However, the completion of soft mate is enough to allow one engineer to enter Discovery’s aft compartment, via a few waivers. This was decided by the ERB, which opted against moving the orbiter from her current position, allowing for an attempt to “re-secure the separation nut reaction fixture to the vehicle structure”. The ERB also noted that the specific issue with the aforementioned nut reaction fixture – which locates and holds the nut for threading the attach bolt in – had apparently not been secured correctly by pip pins, and had actually rotated away from the fixed location. The entire repair procedure is only likely to impact the flow by a total of 12 hours, likely resulting in rollout to Pad 39A to take place on schedule later this month. Had the ERB called for Discovery to return to her OPF, it is also likely she would have remained on target for the scheduled November 1 launch date. The estimated five day impact – in the event of a rollback – would have been easily buffered by what is a large amount of contingency time in the STS-133 flow. UPDATE: The work on IPR-39 (Interim Problem Report) was completed by the early hours on Saturday morning, allowing mating operations to continue. Meanwhile, Space Shuttle Manager (SSP) manager John Shannon took the opportunity to ask his teams to remain attentive on the latest Shuttle Standup/Integration report (L2), as the relatively long gap between shuttle missions will soon come to an end. “It is such a great day to be rolling Discovery over to VAB. We will do that safely and get mated up to the tank,” noted Mr Shannon on Thursday. In two weeks we will get out to the Pad, and will bring ET-122 out to the Cape. So, things are picking back up and we are rolling right along.